This tool was originally made to download the top ranked Beat Saber songs, but was updated to allow for more categories. 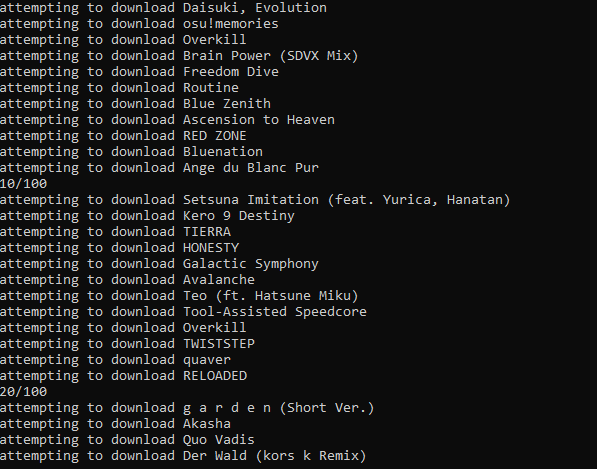 Just give the program your Beat Saber path, specify a sort category, and give it a number to download, and it'll go through the results from the ScoreSaber API and download the songs from it. The tool is free, but I've enabled donations. Just click "no thanks, take me to the downloads" after clicking "download" if you aren't interested in donating. This is NOT a mod. 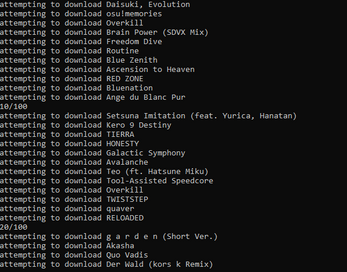 It's an tool that you run outside of BeatSaber to automate the downloading of songs. I'd recommend keeping the tool off your desktop as it generates a ton of temporary files (it'll delete them). Great program, I've been recommending it to people in the Discord. I was trying to get this to work and i put the directory to go to custom songs instead of going to the beat saber folder, idk how to fix this i tried uninstalling reinstalling, I also tried changing the save_dir file to take away the custom songs part, hoping it would go to the beat saber file instead, but these things aren't working, idk what to do, any help would be appreciated. Just delete the save_dir file and run the tool again. It'll ask you to specify the Beat Saber directory again. I love the plugin but I have a question, is there any way to download the most recently ranked songs? When I tell it to download (lets say 10) ranked songs, it downloads the 10 songs that were ranked first (I assume) and not the 10 most recently ranked songs. Any help would be amazing, this is the plugin I've been looking for for months! I don't think the ScoreSaber API (the interface with ScoreSaber itself) allows for those types of requests. All of the sorting options in the tool are what the ScoreSaber API allows me to do. You could download every ranked song by getting the total and entering that. The ScoreSaber API is missing documentation (or I can't find it) and I don't have a good way to find the total number of ranked songs using scripts. If I could, I could just make it work backwards from there. Thanks for the reply, hopefully they change that soon cause my song collection is getting pretty big!